From Matt McGinn, Jonny's guitar tech, through Coldplay's "Oracle" Q&A service: "I can't remember where he picked it up - maybe Chicago? - but, if you're interested, it's a '72 Thinline from about 1974. It's half hollow - so, semi-semi acoustic, I guess - and has a lot of really nice gouges in it from being thoroughly thwacked. All still original, as far as I know. I reckon it must've cost him about 2000 US dollars but God knows what it'd be worth now. You can get a pretty good Fender copy/reissue these days for a lot less, off the peg, that might turn out lovely after a few years of playing it. That's the thing, any old guitar can be amazing if you love it enough." At 19:39 in the source video, Alex can be seen playing a Fender Classic Series '72 Telecaster Thinline in Natural. There are moments when the screen zooms in and you can get a clear view of the guitar. In this Panic! At The Disco live performance of "This Is Gospel", Brendon can be seen playing a custom white '72 Thinline Telecaster throughout the video. Here Richey can be seen playing live with a Natural coloured Fender Classic Series '72 Telecaster Thinline. Ross uses a Fender Classic Series '72 Telecaster Thinline in Candy Apple Red in this video. It can be seen best at 1:59. At 1:55, Nile Rodgers uses a Fender Thinline Telecaster. In this video, he talks about his collaboration with Daft Punk for their last album "Random Access Memory"
Felix White is seen here playing his Fender 1972 Vintage Thinline Telecaster in a Natural finish. In this video of Rilo Kiley performing, at 1:33 minute mark, we can see Sennett playing Fender Classic Series '72 Telecaster Thinline with a Norwegian sticker on it. 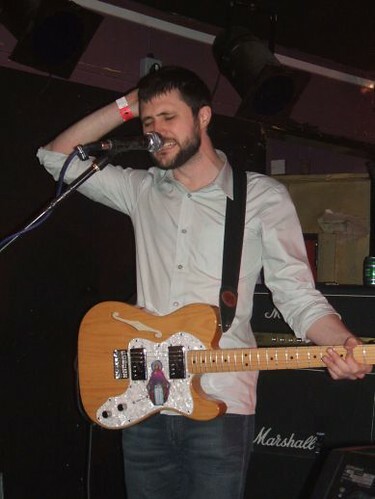 John Nolan can be seen in this image playing a Fender Telecaster Deluxe. In this [article from *Guitar World*](http://www.guitarworld.com/interview-taking-back-sunday-guitarists-eddie-reyes-and-john-nolan), John says about playing Fenders "I love the feel of the Telecasters, although I don't like the sound of the pickups that come on the regular Telecaster. I prefer P90 pickups a lot better; that way, you get a feel of the Telecaster and get a sound that's more like a Les Paul." Carlson's Tele is equipped with Seymour Duncan Phat Cat P-90 neck pickup and a discontinued Joe Barden Bridge pickup. In an interview with PlugIn Music from June 2008, Carlson said the following about using Teles: "Well, I actually used one on “Phase III” on the first song “Harvey” and on “Tibetan Quaaludes.” And when I was, you know, gone for a while during my hiatus, I was listening to a lot of Tele players like Danny Gatton and Roy Buchanan, and Roy Nichols (Merle Haggard’s guitar player), a lot of Cornell Dupree, that R&B player. So it was the guitar I was listening to a lot and I remember how much I liked it back in the day. So I wanted to try something new, and I like the Telecaster how basic it is. It’s kind of like a guitar you have to work at or work with. It’s not super-easy to play like a Les Paul. It has its own thing that you kind of have to kind of know…I don’t know. Early Led Zeppelin was actually done on Teles, and it was the first solid body and the simplest one, and so that had a lot to do with it." At 1:41, Mark shows off several guitars including this Fender 72 Thinline Telecaster "with the Humbucking Pickups." In this Reddit post, Nick states that he uses a Thinline Tele with a StewMac body, AllParts neck, a Seymour Duncan Vintage Stack in the bridge and a Bill Lawrence Keystone in the neck. This was posted on his Instagram page. And he can be seen playing this in live performances. From 4:25 Chris can be seen with his Thinline Tele. Ben can be seen here performing as Radical Face. The guitar is a '72 Telecaster Thinline. Can be seen using guitar in this instagram post. Julia's seen holding a Fender Classic Series '72 Telecaster Thinline in the following Instagram post. at 0:09 in the video you can clearly see the make of the guitar. had it a very long time. Used in the live performance of 'No Warning' as support act in 5 seconds of summer's sounds live feels live tour in the UK and Ireland. It can be seen throught the video. In this photo from the Caspian Facebook page, Calvin can be seen playing a '72 Telecaster Thinline. in the left the guitarist main guitar. 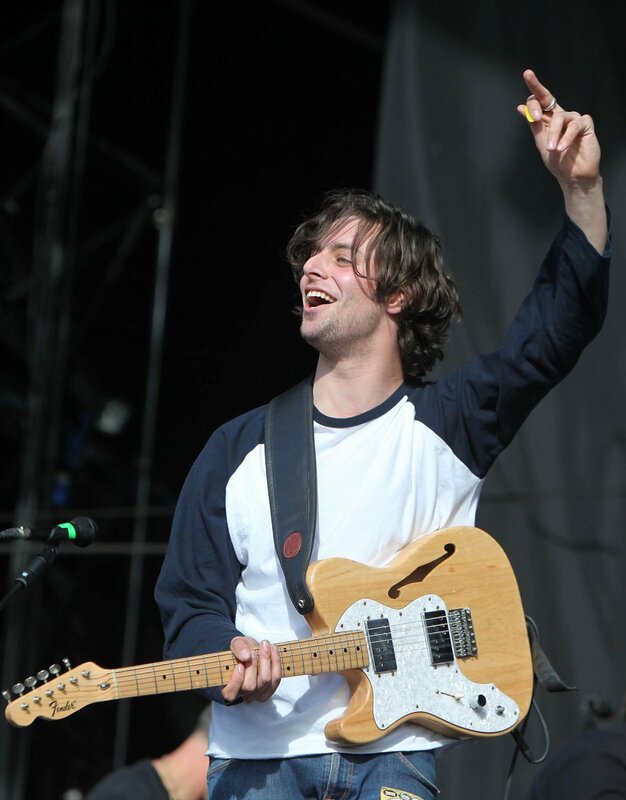 For guitars, Jonny has been seen using a Classic Series Thinline Telecaster. The item can be seen in the entire video. McKay is left handed and always favored vintage instruments. He’s used many guitars over the years, but his number #1 was a left-handed ’72 Gibson 335. Other guitars he used back in his tenure with Earth Wind & Fire included a Les Paul Custom, Fender Telecaster, Gibson L5, and a Gibson SG. In this Instagram post made by Ichika on December 27th, 2017, his guitar rig is shown to consist of a Fender 72 Thinline Telecaster among dozens of Ibanez guitars. My main studio and live guitar. I use my '72 reissue for just about everything. The neck is perfect and the intonation is great! The wide range humbuckers in my opinion are a bit less dark then the humbuckers on my Blacktop Strat and gives the guitar a very lively tone. Overdriven or clean, this guitar fits the bill. It is also light, and because I love to jump around on stage, low weight is fairly important for me! The first thing I looked for when I was trying out guitars was intonation. All the ones I had played before I picked the 72 tele from the top, they were all craggy with intonation. This guitar is not tone-def, and has great intonation. The current WRH are apparently a shadow of the original WRH, but I like them. The guitar has a poppy, crisp sound not often seen in humbuckers. Pickup selection goes from most umph to least umph, good for cleaning up a tone that needs less low end. Bridge selection sounds good for hard rock high-gain, neck for worship guitar fullness. The only complaint I had about this guitar is that the bridge saddle pins were a little short when I bought the guitar. I tried adjusting the height of the strings without messing with the truss rod, and didn't have much pin to move the string up. But I got it at a reasonable height. Such a nice sound! A real Coldplay guitar! One the favorite guitar of Jonny Buckland thats why i bought it and it was a good choice. I have the rare custom colour version (Lake Placid Blue). The pickups are a bit dull and lacklustre, and the neck is way too hefty for my taste. Still more than a decent guitar; with clearer pickups it'd be pretty good, actually.